On the way up to visit family in Yorkshire, I stopped off in Docking, Norfolk, to view a couple of Tett Turrets discovered by Justin Aldis. Justin remembers playing in these turrets as a child, and they are basically the same 30 years on. They have survived in a strip of scrub between pasture and housing in the village. As far as I am aware, the only other known remaining examples of Tett’s are at RAF Hornchurch and on the Isle of Man, so these are an incredible survival and just illustrate what is still out there to be found. 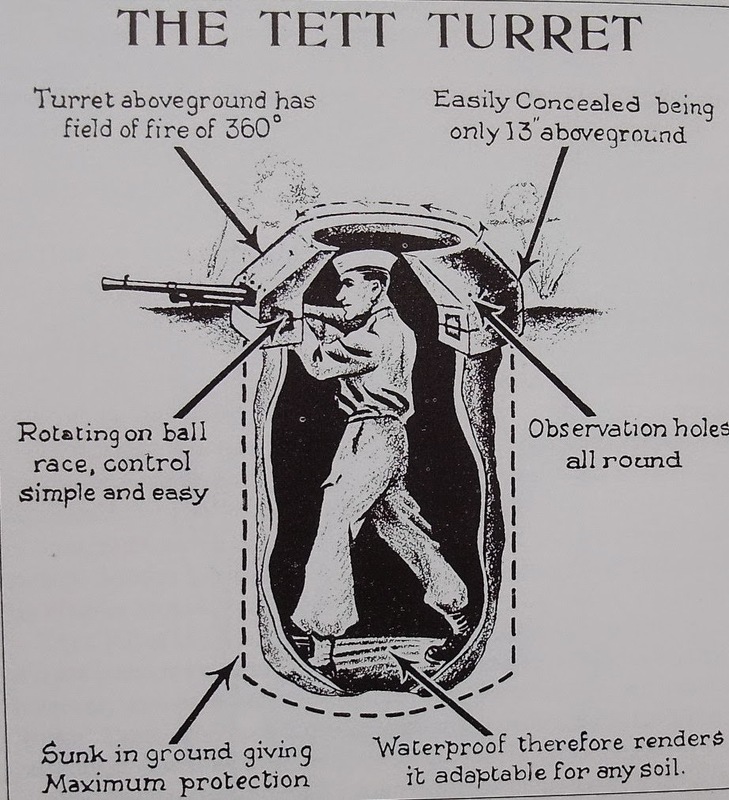 The Tett turret was designed and manufactured by Burbidge Ltd of East Horsley, Surrey. The specification was a mounted turret on a sunken concrete pipe. 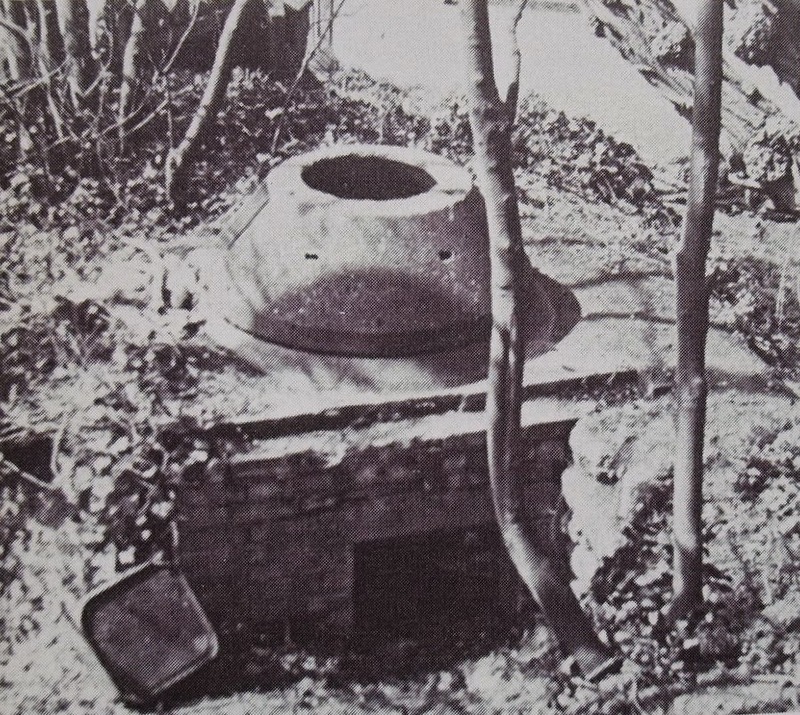 They also recommended siting turrets in inter-connecting trios (reference: “Pillboxes of Britain and Ireland”, M Osborne). 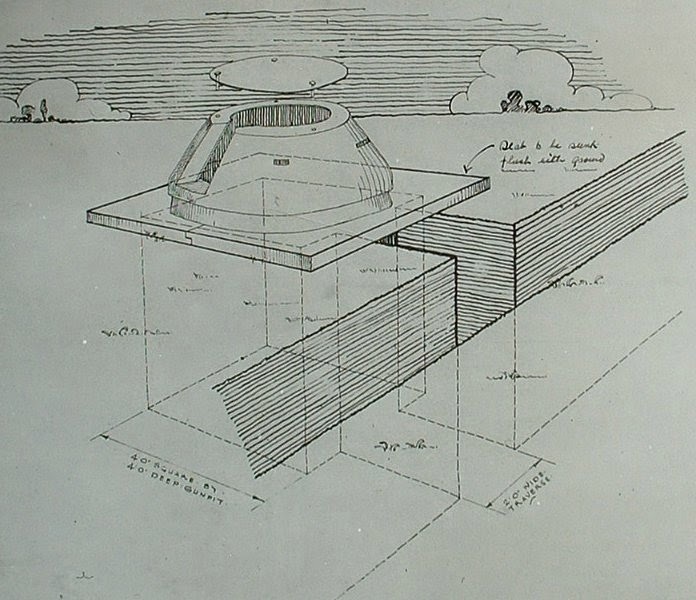 Above: Two sketches of the Tett Turret. 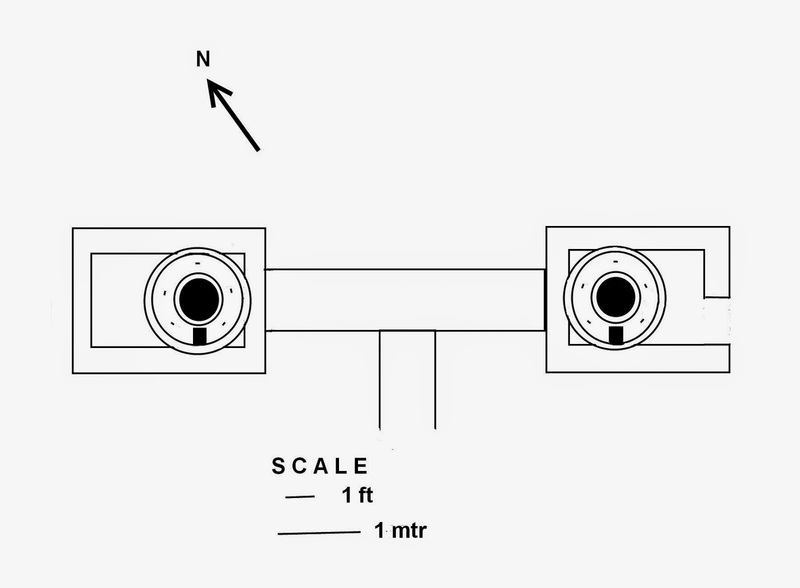 Top image shows the manufactures specification of mounting the turret over a sunken concrete pipe. The two turrets are about 12 ft apart, joined by a concrete tunnel (approx 29” diameter). The turrets are mounted on a sunken brick structure, the walls being 1 ½ bricks wide (giving an approx 15” thick wall). The internal dimensions of the brick structure are 42” wide, 72” long and 53” high. One of the structures has an apparent entrance, which I assume would have originally opened into a slit trench allowing access to the turret. A spur concrete tunnel leads off the tunnel joining the two turrets; I did not explore this as Justin informed me that it has already collapsed along its length (where did it lead to - perhaps a third turret??). The turrets are cast concrete and are mounted on a concrete ring. A 6” thick concrete slab forms the remaining roof of the brick structure. A metal seat (or step) is suspended from the turret. The turrets have an 8” wide embrasure and five splayed observation slits. 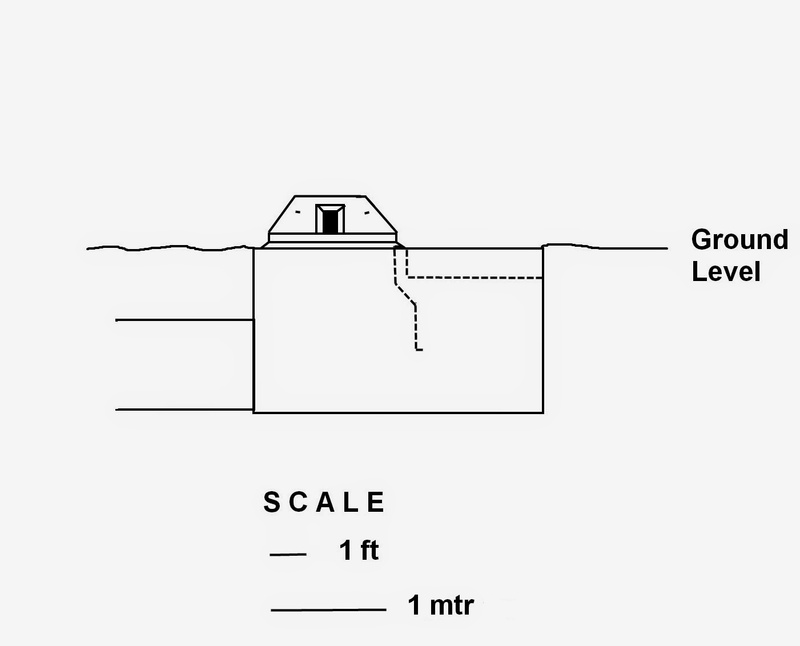 Above: Plan of brick structures and concrete pipes (with turrets shown) and profile of the brick structure. The basic design seems similar to the example at Sudbury (which has sadly now been destroyed) i.e. the turret mounted on a brick chamber rather than the manufactures specification of a sunken concrete pipe. Above: The Sudbury Tett turret (now destroyed), also mounted on a brick structure. “An alternative to concrete works capable of withstanding determined attack was the small steel machine gun post distributed in depth as found during the last year of the Great War – the Hobbs casemate. This was basically a steel cupola mounted over a 3ft 9 in pit with only 18in showing above ground level. The rationale for this was the age old problem of gun and armour – the gun would always win in the end. Even the Maginot type of fortification was not impregnable. These small posts were inconspicuous, easily hidden and were bullet and splinter proof. It would be hard for a tank to hit except at short range. GHQ noted that a number of similar designs existed at the War Office and were worthy of further trial. They would require less steel per weapon to be protected than reinforced pillboxes. They were designed to fit into a system of field defences. Presumably the Tett Turret and Allan Williams Turret were examples of these designs. The idea was never really taken up as so few of these structures were constructed. I must admit I don’t know much in detail about Norfolk’s defences. Docking was a category A Nodal Point / Defended Place and also a Brigade HQ. The military seem to have adopted quick and easy constructed prefabricated structures to defend Docking – a number of Norcon pillboxes also survive in the village. More conventional pillboxes can be found in nearby villages and at RAF Docking. Justin informs me there is an active local history group in Docking, currently concentrating on WW I but hopefully they will turn their attention to WW II soon, so we may get to find out more about these amazing survivals and the history of Docking during WW II. Above: Top - a Norcon pillbox which is nearby to the two Tett turrets. 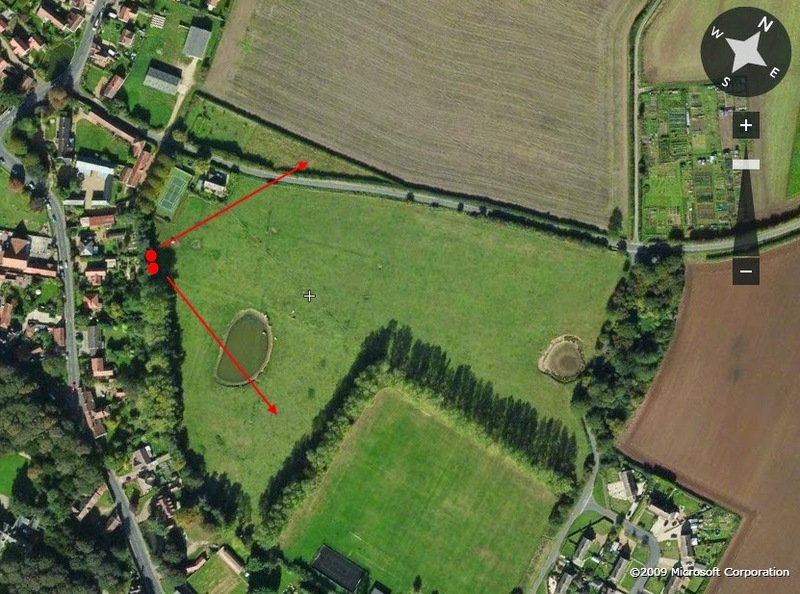 Bottom two images show a conventional Type 22 pillbox at the site of what was nearby RAF Docking.